Nippon, a Japanese photography magazine, has published a 'prediction calendar' page on new product announcements from major camera manufactures like Canon, Nikon, Sony, etc. As you can see, the manufacturers' names are on the top and the months are on the left hand side. 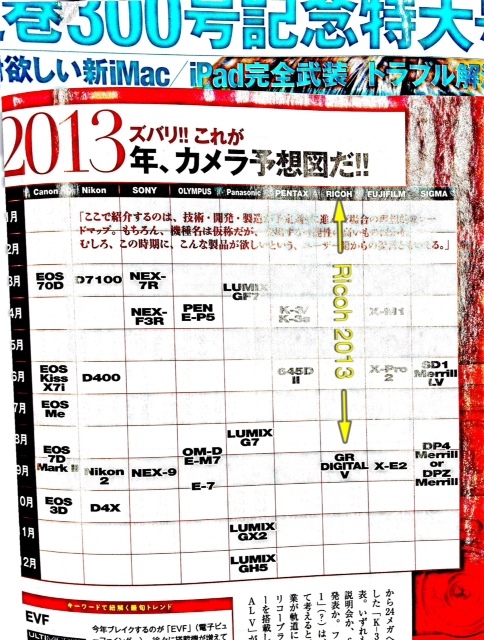 According to this magazine, the Canon EOS-70D and the EOS-7D Mk II will be announced in March and August, respectively. The ever elusive Canon EOS-3D will appear in October together with the Nikon D4X. I cannot vouch for the accuracy of this prediction, just enclosing this page for your entertainment and add some levity to the photographers' watch list.